I wanted to close out this week of One Pot Wonders with a real comfort dish, and if this isn’t it then I don’t know what is! 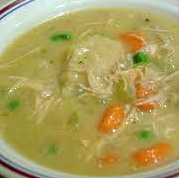 It’s Chicken and Dumpling Soup, Maximized Living Advanced Plan style. You can still enjoy bread, dumplings, biscuits, cake, etc, on the Advanced Plan — you just have to know what to put into it to make it a whole, healing food. This soup can be prepared in advance the night before. Simply store the crock pot in the fridge over night then set on Low in the morning before work. The dumplings are super easy to make. Drop them into the soup when you arrive home from work and the soup will be ready by the time you get changed and settled in. Hope this week of One Pot Wonders has been helpful for you and your family. Dave and I personally live off of one pot meals thru each week, so we value the variety in our Advanced Plan options. If you have your own favorite One Pot Wonder, I would love if you would share it and I will post for all to enjoy: elise@healingcuisinebyelise.com. 1.) Make the dumplings: Mix together eggs, sea salt, pepper and almond flour. Mix until well-blended – will be sticky. Shape into balls by rolling in your hands. Place in the fridge. 2.) In large crock pot, add all Chicken Soup ingredients except for heavy cream, filling pot with enough vegetable stock to cover the chicken and vegetables. Cover and simmer on Low for 6 hours or High for 3 hours. OR store in fridge over night and simmer 8 hours on Low or 4 on High. 3.) At the last 20 minutes of cooking, remove the dumplings from the fridge and place them in the soup. Cooking the dumplings will take about 20 minutes. At this time, you can also stir in the (optional) heavy cream or almond milk — makes for a more rich and opaque broth. When dumplings are ready, you can serve! Oh my gosh, that idea never came to me! The dumplings are my fav part, too! How smart! Totally making that the next time we do stew…soon because I just picked up stew meet from the farmer this week! Yum, you’ve got my mouth watering Ash! Is there another flour that would work in this recipe? Unfortunately, we have nut allergies. Thank you! Check out this recipe for Rice Flour Dumplings: http://recipes.sparkpeople.com/recipe-detail.asp?recipe=398535. However, this would not be an Advanced Plan dumpling option. I cannot wait to try this recipe! It is one of my favorite dishes, so I will let you know how it goes next week. Great Chris! I hope you like it!! My husband’s favorite part is the almond flour dumplings. He’s always so happy he can still enjoy one of his favorite soups from his childhood. Thank you for your delicious meals that we can enjoy on busy winter nights as well as throughout the year! WONDERFUL Jenny!!! Freezer Meal Night, what a great idea! I hope everyone enjoyed it. Enjoy eating stress-free for the next few weeks! Hi Megan! They shouldn’t be soggy soft…but the outside should be a little bit soft/moist. It’s hard to describe I guess…the picture definitely does not do it justice. LOL Enjoy! This is probably our favorite soup recipe on the whole site! ← download Season’s Eatings e-Book today!